Playing with Electrons to Make Stories: Small Update - Baku! So, I was kinda lazy today, so I only made one Forest Manager. Two more to go! Lady of Dreams, Mistress of the Mind. Traits: Nocturnal – Acute Hearing, Infrared Vision, and Night Vision. ****Psi-Talents. *Field of Dream-Fog: Baku produces a thick miasma of Dream-Fog around herself when she is threatened. This fog of dream-stuff acts as a force-field that refreshes at a rate of 5 per round. **Dream-Stepping: Baku is capable of teleporting adjacent to any creature able to dream as long as they are within 200 meters of her. The creature does not need to be within line of sight, this ability is not impeded by obstacles between Baku and her target creature. ***Dream-Summoned: Once per day Baku may directly teleport to anyone in Elysium who calls out “Baku-san, come eat my dream.”. Baku may chose not to teleport to the person, and knows the identity of as well as the most recent dream of the caller. **** Psi-Talents: Baku is a true queen of dreams and the minds that produce them. Baku is capable of manipulating the minds of any creature capable of dreaming. Baku is capable of using certain Psi-Talents a set number of times per day and others at will. Caster level is equal to Baku's Hit-Dice At-Will each: Sleep, ESP, and Truth Sense. 4 / Day each: Beguile, Mind Message, Mindbolt, and Telekinetic Shield. 3 / Day each: Enthrall, Mind Wipe, and Silence. 2 / Day each: Clairvoyance, Speed, and Suggestion. 1 / Day each: Confusion, and Melee Shield. Special: Dream-Fog: Baku produces a thick miasma of Dream-Fog around herself when she is threatened. This fog of dream-stuff acts as a force-field that gives +1D4 armor. Dream-Stepping: Baku is capable of teleporting adjacent to any creature able to dream as long as they are within 200 meters of her. The creature does not need to be within line of sight, this ability is not impeded by obstacles between Baku and her target creature. Dream-Weaver: Once per day Baku may directly teleport to anyone in Elysium who calls out “Baku-san, come eat my dream.”. Baku may chose not to teleport to the person, and knows the identity of as well as the most recent dream of the caller. Dream-Mistress: Your mind, is her mind's submissive slave-monkey. She is capable of dominating the weak-minded, especially the unimaginative. Field of Dream-Fog: Baku produces a thick miasma of Dream-Fog around herself when she is threatened. This fog of dream-stuff adds +4 to Baku's AC. Dream-Stepping: Baku is capable of teleporting adjacent to any creature able to dream as long as they are within 300 feet of her. The creature does not need to be within line of sight, this ability is not impeded by obstacles between Baku and her target creature. 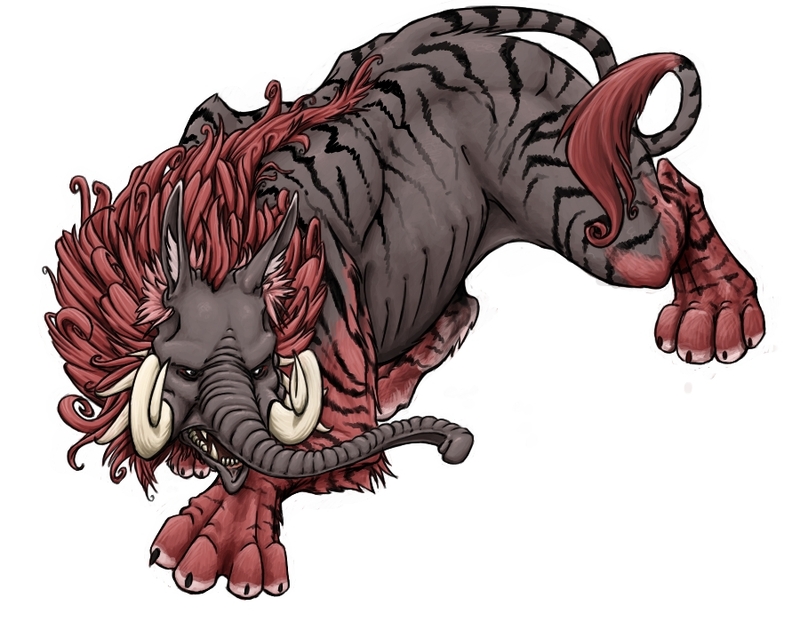 Dream-Summoned: Once per day Baku may directly teleport to anyone in Elysium who calls out “Baku-san, come eat my dream.”. Baku may chose not to teleport to the person, and knows the identity of as well as the most recent dream of the caller. Spell Casting: Baku is a true queen of dreams and the minds that produce them. Baku is capable of manipulating the minds of any creature capable of dreaming. Baku is capable of casting certain spells a set number of times per day and others at will. Caster level is equal to Baku's Hit-Dice At-Will each: Sleep, ESP, and Detect Lie. 4 / Day each: Charm Person, Message, Magic Missile, and Shield. 3 / Day each: Enthrall, Forget, and Silence. 2 / Day each: Clairvoyance, Haste, and Suggestion. 1 / Day each: Confusion, and Protection From Normal Melee Weapons.